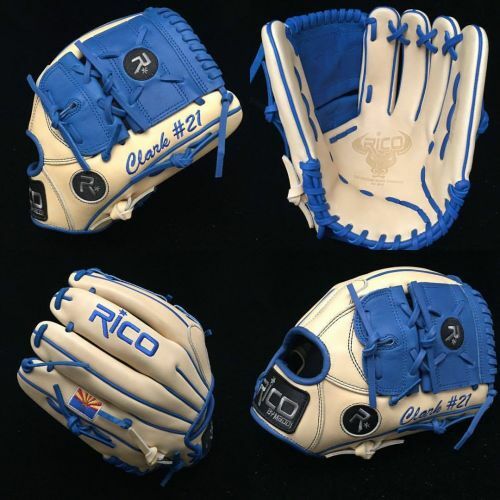 Rico by Maddi is all about customization of your new glove. We can customize colors, stitch names and numbers. Please fill out our glove form above. personaliztion of the gloves with name or number stitiched. For a custom logo we can do it for an additonal charge of $15.00 dollars. Please send to tony@ricogloves.com with your order #. The wait for a Custom Rico Glove is worth it because your new glove will be one of a kind. Please contact with customization and/or personalization questions ! tony@ricogloves.com. Please fill out the custom glove form and proceed to checkout. If you have any questions please let us know. Thanks! !